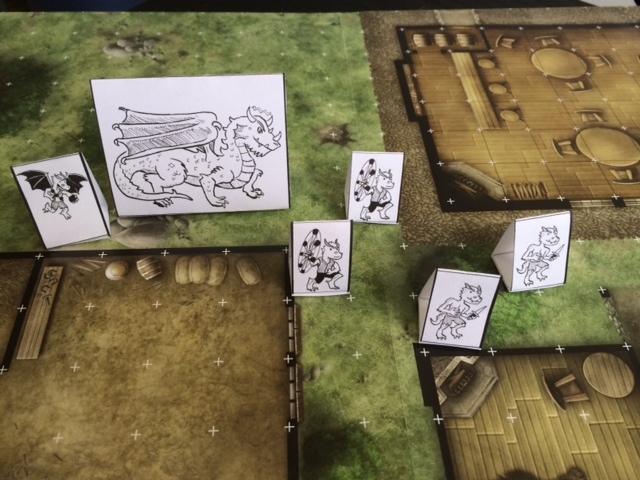 I’ve been making my own stand-up paper miniatures for D&D, so I figure I should share them with people! A few months ago I produced a bunch of PCs, and now I’m working on monsters. First up is everyone’s favorite level-one nemesis: the Kobold! And I’ve given them some support with a couple of drakes, and a dragon who controls them behind-the-scenes. (Also, I understand that these minis might be useful during the first part of Hoard of the Dragon Queen, if you’re running it this week). Just download them from the links below and print them out on cardstock. Then cut along the thick lines, fold along the thin lines, and tape them together! Coming soon: Bullywugs and Modrons! Oh right, there are a lot of cultists, aren’t there? I’ll try to get on those next!